Fantastic 5 Bedroom Home on Lake Leelanau!! Summer 2019 Still some time left! 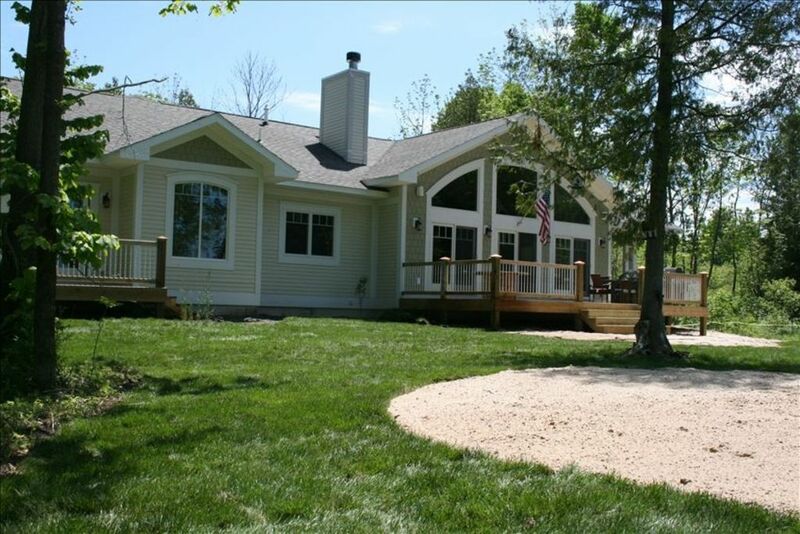 Built in 2008, this very warm and relaxing 5 bedroom home on Lake Leelanau is ready and waiting to treat your family and friends to some memories that will last a lifetime. Lake Leelanau, situated in the heart of Leelanau Coutny, is an all sports lake with endless opportunities for family fun! Whether it is wine tasting, shopping, taking in the fall colors, fishing, boating or just napping the quiet summer days away, this is the place for you. Your home away from home is located on 4 very private acres of pure heaven. The house sits 600' off the road and is surrounded by lush vegetation and woods. The large lake side deck overlooks the lake and provides a front row seat to some of the most spectacular sunsets ever produced. The house has a private dock with some swimming available for the kids. A nice swingset also is located in the front yard with lots of play areas. Mom and Dad can relax on the deck or in the hammock while keeping a watchful eye on the little ones. A large stainless steel grill is big enough to serve several people. Indoor/outdoor sound system allows for everyone to enjoy their favorite music while soaking in all that Leelanau has to offer. Enjoy the fully equiped gourmet kitchen with island that should please anyone wanting to prepare a feast fit for kings. This is truly a wonderful place to spend some time recharging and building memories with your family for a lifetime. Give us a call if there is something specific you would like and we will do our best to accomodate you. Leelanau County has more than a lifetime of exciting things to do. There are beaches, quaint small towns for shopping and dining, golf courses, charter fishing, wine tasting, sight seeing, and on and on. Michigan and certainly Leelanau County has just about anything you want. All of this is located within 10-15 minutes of the house. It is important to note that this is a fully provisioned rental property. All linens, cooking equipment, flatware, cooking spices, and so much more are all provided. We want our guests to feel as if they were staying in their own home with all the necessities included. Please note that the base rental includes up to 10 people in your group. There is a $40/per person per day fee added for those parties over 10 guests. Beautiful accommodations, beautiful location. Fully equipped with everything needed. Great family experience. Terrific house for entertaining, both inside and out with a beautiful deck, plenty of seating and a nice grassy backyard. Wonderful home in a perfect location! Great house! Jeff was fantastic and so helpful and easy to work with. We had a wonderful week. I was overly impressed with our entire stay at Jeff's home. From the communication we received beforehand, to the greeting upon our arrival, and the stay at the house. Everything was perfect! The house was even better than depicted on the site. It was VERY well equipped with everything you would ever need, even down to the small touches like extra tooth brushes and toothpaste. I can't say enough good things about our stay. We felt right at home and will definitely be back! Thanks Jeff!!! Even better than the listing! Our family recently stayed at this home and it was wonderful! Many family memories made that week. When we first arrived we commented that the home is even better than that pictures portray it. The house is fully furnished and had everything we needed for our vacation. We will definitely be back! Our FAVORITE part of summer! We just booked for this coming summer! We have gone to this home for several years and it is something we look forward to ALL year! The owners have an eye for detail, comfort and hospitality. The photos give you an idea, but don't do it true justice! The home is well-maintained, spacious yet cozy, tastefully decorated and ready to welcome you for a memorable visit! It is a BEAUTIFUL lake front property! There is a lovely little sand area for sunbathing, hammock for relaxing, large deck with grill, pier to lazily anchor a raft (we usually bring a kayak and tie that up there as well! ), swing set for the kids, chair swing to enjoy sunsets, fire ring for evening roasts and so much more!!! We find new areas and restaurants to explore each time we go. The owners have left plenty of information about the area to assist you with your visit! I can't say enough positive things about this property! You won't be disappointed...book now! This home is the nicest vacation home I've had the privelage of staying in. It's spacious, private, has breathtaking views of the lake, peaceful and has every ammenity you will need. Not far from town and other attractions in beautiful Michigan. I had no problems with cell phone coverage and was able to stay connected with the world if I chose too. The sunrises and sunsets over the lake are magnificent. Definitely a place to appreciate nature. The stars are so bright, and appear so close, you could reach up and take them. Cannot wait to go back!